Read the Bible in King James Version (KJ). 1. Listen to any chapter from the Bible. 2. 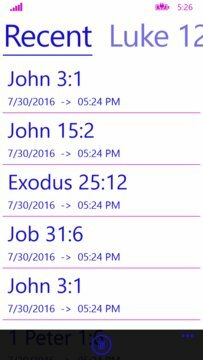 Send verses via email, Facebook, Twitter and other forms of sharing. 3. Copy verses, even the whole chapter if needed. 8. Read the Bible in one year. 9. Add (Info) to your calendar. 10. Saves your recently read chapters. 11. Find text on page. 12. 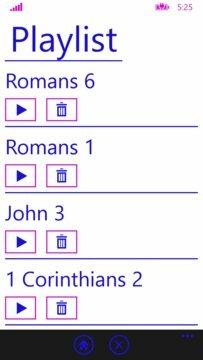 Pin your favorite verse to Start Screen. Change the verse color, padding, indent, spacing, font size, font family and opacity. We provide 10 stock images but if you want to you can add your own background image, or background color.